Sekapur Sirih traditional dance is a welcome dance from Jambi dan Riau Province, Indonesia. This dance is having slow and delicate motion which accompanied by traditional instrumental to welcome the honor guests. The motion of the dance is showing the humble heart of the indigenous when welcoming the guests. 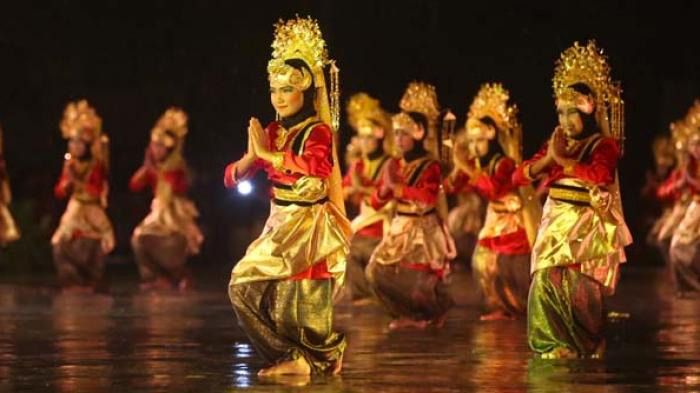 Sekapur Sirih dance is mostly present by 9 dancers, which divided by 3 male dancer, 1 umbrella person and 2 guards. The dancers are using particular properties like Cerano or the a jar that contain of betel leaves, umbrella, and Keris or traditional dagger. The wardrobes that being used by the dancers are Baju Kurung, or traditional clothes from Jambi. While the instruments are taken from traditional malay music, which include of violin, harp, accordion, tambourine, gong and drum.